The sparkling Greek Island of Santorini is home to the Anemos Studios located in the rural peaceful area of Perissa. The 3-star Anemos Studios are all about relaxation and soaking-up the sun, offering modern and functional rooms and studios spread over 2 separate buildings, a shared swimming pool with sun terrace and pool bar. The lively resort of Perissa is a 15-minute walk and the glorious beach is only 150m away. 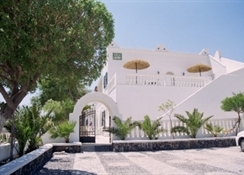 Book into the affordable Anemos Hotel-Studios and enjoy the mix of lazy days and lively evenings. Getting to the hotel: Santorini Airport serves. Local tips: A 15-minute walk to the lively resort centre to find restaurants, bars and tavernas. Food, drink and entertainment: Breakfast area and pool bar. Sport, games and activities: Swimming pool (shared) with sun terrace, loungers & parasols. For the kids: Discounted rates for children; baby cots available. Additional: Front Desk services and housekeeping, safe box (extra charge). Guest studios are bright and clean with whitewashed walls, cool tiled floors and comfortable wood furnishings, and include a private furnished balcony or terrace, air-conditioning available (on request at a local charge), private bathroom and fully-equipped kitchenette with fridge and kettle. Rooms are on a B&B rate and studios are on a room rate only.